Just about every month, it seems, we get a report on the dismal state of Arctic sea ice. By contrast, the shiny white stuff surrounding the Antarctic continent has been remarkably stable in a warming world. This year, however, the sea ice at our planet’s south pole is crashing, and scientists don’t know why. It’s late summer in Antarctica, the time when sea ice always hits its annual minimum. This year, that minimum marks a dramatic new record—the smallest sea ice extent since continuous satellite coverage began in 1979, by a long shot. Sea ice reached an estimated 2.188 million square kilometers on March 1st, according to near real-time data provided by the National Snow and Ice Data Center. The previous record low, of 2.296 million square kilometers, was set on February 28th, 1997. The difference, of 0.12 million square kilometers, encompasses an area larger than the state of Maine. It’s particularly strange behavior in light of the long-term trend for Antarctica: small but significant sea ice growth. In fact, Antarctic sea ice reached a record maximum in October 2014. 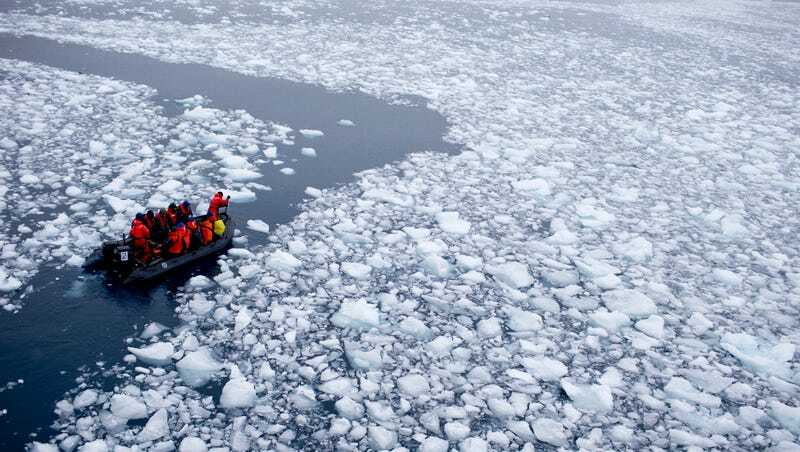 But while Antarctic sea ice growth has long been a source of fodder for global warming skeptics, experts say it speaks more to the complexity within the Earth’s climate system, among other factors. For instance, a study published last year in Remote Sensing of Environment postulated that winds controlled by Antarctic continental topography, and currents controlled by the depth of the Southern Ocean, help keep Antarctic sea ice relatively stable, especially when compared with the Arctic. Another study, published in 2016 in Nature Geoscience, argued that Antarctic sea ice expansion between 2000 and 2014 was driven by decadal climate variability in the tropical Pacific. Still other factors, like the ozone hole over Antarctica, can influence regional winds, heat transport, and sea ice cover, Bitz said. In short: Antarctic sea ice is really effin’ complicated. And scientists don’t expect clear-cut answers to this year’s icy mystery anytime soon. While it might be tempting to cry “climate change” in response to the shrinking ice, that’s not necessarily the case. Son Nghiem, senior research scientist at NASA’s Jet Propulsion Laboratory and author of that Remote Sensing of Environment paper, agreed. “We should not read too much in to this one data point by itself in this austral summer as one point in time is not sufficient regarding the climatic time scale of multiple decades,” he told Gizmodo in an email. Nghiem added that the region experiencing the most ice loss this summer—the Bellingshausen Sea west of the Antarctic Peninsula—has, in fact, been losing sea ice for the past several decades, bucking the continent-wide trend. In that light, this year is perhaps not so surprising. Bitz wants more data on recent sea surface temperatures and wind conditions before she draws conclusions about what’s fueling the recent record low. (Unlike sea ice cover data, which we receive in near real time via satellites, data from ocean buoys and weather stations is typically delayed several weeks to several months.) But, she added, this year “is consistent” with our expectations for Antarctic sea ice over the long-term.